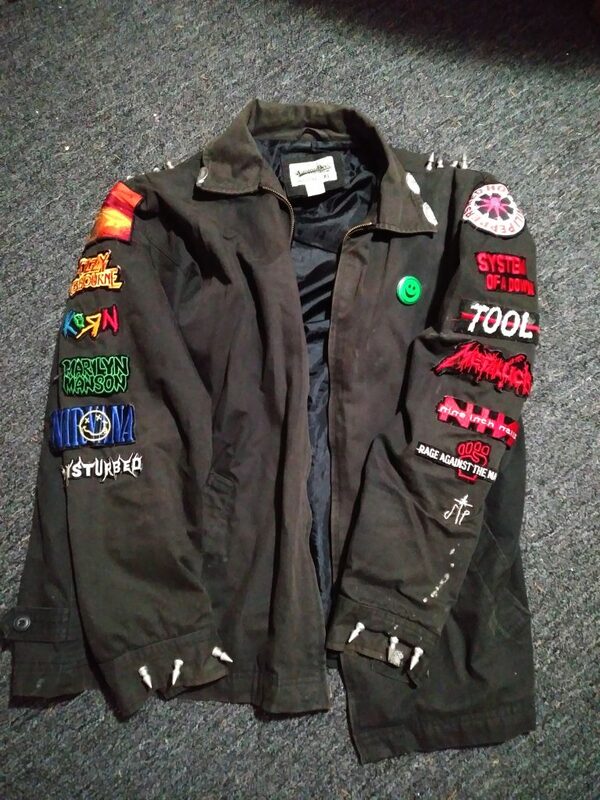 Show Me Your Patches: Glass Divide’s Mike De La Morte Presents The Full Metal Jacket! Look! There in the closet! It’s a ball-gag! It’s a baby photo! No! It’s the one and only Full Metal Jacket! Grab a seat and gather round kiddies, and Gargamel will tell you a tale… A tale of this wonderful wearable memento from a bygone era of art and music that inspired me to become a vocalist! The origins of this most treasured article in my collection dates way back to the year 2007 A.D., when I was but a young lad working in the Trumbull Mall, and Steve and Barry’s Universal Sportswear was a thing. Ya’ see, S&B sold a lot of cheap, yet surprisingly decent and wearable, crap. Scraping together my precious monies after paying my flip-phone bill and purchasing my handle of Dubra (a priority provision of the time) I was able to snag myself this cool looking, all-season, completely adequate, “Original Jimmy Dee” jacket for about 14 bucks. What a steal! It had everything I needed. A collar! Armholes! Space for artistic revelry! Like veteran that has seen some serious time in the field, this well-soiled adornment has serious stories to tell. It has been with me through the thick and thicker, gracing my aching body along strange, cold trips to shows locally, and New York especially (Gwar, Misfits, Green Jello, Skinny Puppy, Machine Head, and KMFDM are a few that come to mind). Like a tried, true, and faithful friend, this thing literally had my back, whether huddling for tickets, trekking the frigid streets for alcohol, or waiting for the 6AM train ride home. Combined with spikes, camo pants, and a pair of steel toes, this jacket made a singular statement of volatility to anyone in my warpath — See you in the pit, f*cker! In between shows, I had a blast decking this puppy out with patches and creative bits of flair I was able to find, which perfectly reflect my budding yet diverse tastes in music at the time. The jacket has real attitude. Everything is either hand-stitched or pinned; ironing on patches was a lazy no-no. Also, as part of my personal commitment to imbuing this heavy metal armor with “spirit”, washing the ol’ gal was also forbidden – especially when you could cover-up the cumulative concert-stink with a shot of Axe. Why, there even remains a personal commemorative to my favorite industrial-metal band, Bile, on one of the sleeves! Hahaha. Gross? Absolutely. But that’s life, for better or worse. To me, this jacket is more than a token of my youth; it’s a living, breathing thing. I’d be a fool to wash away the earnings of communal bloodshed, drunken tears, profuse sweat, and the stain of food and fluids, things that give the gift color and flavor to an otherwise plain black jacket. 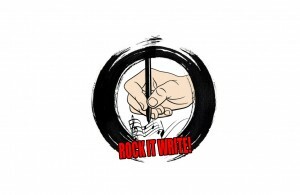 They remain on and within the garment as badges, crucial testaments to my personal experiences in and around music. It’s a wearable piece of art! I supposed the biggest regret I have looking upon this blackened timepiece is the back of the jacket, which is surprisingly bare (save for a Rolling Rock patch, a pin from the Chapel of Sacred Mirrors, and a sweet Mandalorian tribute to the Fett man that I cut from an itchy t-shirt) What can I say? Times were tough, patches are expensive, work was part-time, and I had tickets to buy! In a way, it’s a neglected space that is symbolic of the way things slowly phased out as I grew to become some kind of functional adult. I shed my skin long ago, and it barely fits my wider frame now. 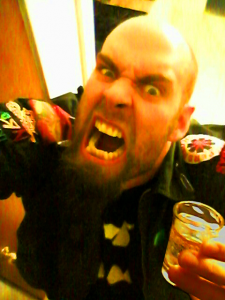 Still, here’s a pic and a toast to one more kick in the face! Slainte! Check out Glass Divide’s next show: the St. Patrick’s Eve Massacre on Saturday March 16th at Tazrak’s in Naugatuck. With Continuum, The Shape, and Disguise the Curse on the bill as well, it’s a monster lineup not to be missed! Also, you can help Glass Divide get on RPM Fest by voting for them here. 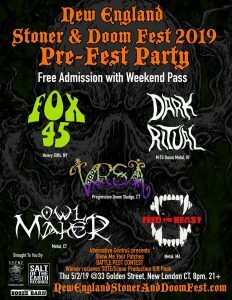 Regional readers, wear your best battle vest/jacket/fannypack/underpants to the New England Stoner and Doom Fest Pre-Party Bash for the Battle Vest Contest on May 2nd at 33 Golden in New London! Winner gets a prize pack from Alternative Control, Salt of the Earth Records, and SCENE Productions. Tickets available here.